Book your B&B in Beijing through this guide. We have selected for you the Bed and Breakfast with low rates, cleanliness, simple furnishing, often located close to local attractions. The bed and breakfast are also considered an easy tool to know the local culture of Beijing. 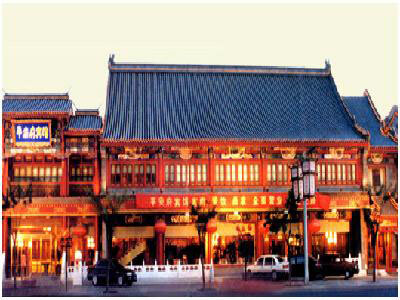 The Beijing courtyard hotel was built in the beginning period of the Qing Dynasty. 20 minutes walking distance from Tian 'anmen square. With a very spacious courtyard and all rooms around it connected with each other by beautiful corridors. All doors and windows face the courtyard so that there is the sufficient day lighting and ventilating in every room. Peaceful and private, you could have your own trees and flowers planted. The tea is freshly brewed and the cosy ambience will give you a perfect start to your Beijing experience., located not far from Tian'anmen Square and are just around 10 minutes vvalking distance to the Wangfujing street. to the airport: 28km; to the Beijing train station: 3km; to the town center: 0km; to Wangfujing: 0km, The hotel is uniquely postitionde to provide convenience as well as quality service.It's located the Wangfujing snack street street tail, may walk goes directly to Tiananmen. from the city center: 0.5 KM; from the railway station: 2 KM; from the airport: 30 KM, The hotel is opened in Jan.19, 2006, managed by American Days Inn Management Group. It maintains unified service standard to ensure the world-wide superior level of service. To east is trade building; to south is Beijing station; to west is west is imperial palace, Tianmen square, Jingshan park, Beihai park; to north is Pingan street, Yonghe palace. 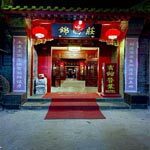 Near Wangfujing pedestrian, imperial palace, Tian' an' men, Jingshan park, Beihai park, Beijing Double Happiness Courtyard Hotel is located at the commercial, cultural and tourist center, and the main conservation area of courtyards. Being adjacent to Dongzhimen transportation junction, Workers' Stadium (where the Olympic football events will take place), Workers' Gymnasium (where the Olympic boxing events will take place), Jianguomen Embassy Area and Chaoyangmen business circle; neayby the Beijing railway station, Dongdan and Chongwenmen business circle, the Imperial Palace, Tian' an men Square, the National Grand Threatre, Jingshan Park, Beihai Park, Pingan Street, Yonghe Palace, and the Imperial Acadamy, it boasts very convenient transportation. The hotel is easy access to the public transportation such as NO.24, 674 and 106 buses and Metro. Line 5. It will take about 20 minutes to TianAnMen Square by subway, about 10 minutes to Bei Hai Park, Hou Hai bar street, the Palace Museum, JingShan park and Yong He Lamasery by bicycle., The Hutong Inn is situated on the Bei ErHuan road, Zhangwang Hutong in central Beijing, closed GuLouDaJie subway station which close to all public amenities and is with walking distance of Bell Tower, Drum Tower, Ditan Park. It will take about 20 minutes to TianAnMen Square by subway, about 10 minutes to Bei Hai Park, Hou Hai bar street, the Palace Museum, JingShan park and Yong He Lamasery by bicycle. 300 meters from airport high-speed, 1.5km from the new China International Exhibition Center, near to Airport Industrial Park, the traffic is very convenient. 5 minutes' distance from T1, T2, T3, only 15 km from city center. The hotel provides free airport pick up and drop off service., Super 8 Hotel (Beijing Capital Airport Tianzhu shop) is a business hotel built according to four star standards, it is located in the west of the Capital International Airport, only 300 meters from airport high-speed, 1.5km from the new China International Exhibition Center, near to Airport Industrial Park, the traffic is very convenient. 5 minutes' distance from T1, T2, T3, only 15 km from city center. 10 minutes drive to city center, 15 minutes drive to railway station, 60 minutes drive to airport; Surrounding landscape: Dorset Shopping Center, Xiushui Street, Joy Inn is an economic chain hotel, which managed by the Beijing Joy Inn Investment and Management CO., LTD .It holds on the international management idea as the precursor, takes advantage of the international popular economic hotels and the characteristics of the high quality, low cost, friendly environment(comfortable, safe, convenient and simple). Distance from the subway Line 5 and Xiping Street :2km; Distance from Beijing Railway Station :12km(by Line 3 Olympic express); Distance from Beijing West Station:15km(by No.387 or 694); Distance from Capital Airport :27km(take taxi to Anzhen Foreign Trade Building, then take No.4 airport bus; take No.4 airpot bus to Madian Qiao dong);, Jinjiang Inn-Madian Qiao, Beijing is adjacent to the north Three Ring. Strong business climate, complete service facilities make it the ideal accommodating place for business and tourism. It is only 0.5km from hostel to Bell and Drum Tower, Tian'anmen Square, Forbidden City, Beihai Royal Park, Houhai Bar Street, Gui Stree and Jingshan Hill Park, 10mins on foot to metro station., Former Beijing Inn (Beijing Hutong home hostel) locates on quadrangle yard of Nanluogu lane on Dongcheng District in Beijing, surrounded by crisscrossed lanes and Beijing Tradition foods. 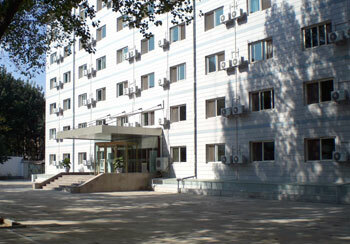 With pretty courtyard and plain clean rooms, the hostel situates at Beijing downtown of Erhuan road with convenient public transportation and metro line. 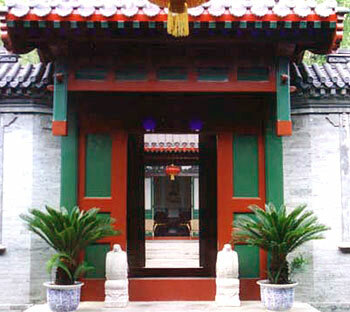 All rooms are furnished by wooden carved furniture and shows showcase the various representatives of chinese traditional culture of decoration.It is only 0.5km from hostel to Bell and Drum Tower, Tian'anmen Square, Forbidden City, Beihai Royal Park, Houhai Bar Street, Gui Stree and Jingshan Hill Park, 10mins on foot to metro station. 800 meters from Line 2 metro Qianmen station Exit C, go along the Qianmen Avenue and toward south, you can see the Shijia Hutong; 5km fro Beijing Station, you can take Line 2 metro to Qianmen Station; 3km to Tiantan Park and Tian'anmen Square. 4km to Forbidden City. 6km from Beijing South Railway Station. 8km from West Railway Station. 31km from Beijing Capital International Airport., The Jinxiuzhuang Siheyuan Hotel is located in Shijia Hutong at Qianmen Pedestrian Street, close to Tian'anmen Square, Forbidden City, Tiantan Park, Chairman Mao Memorial Hall. It is 31 kilometers from Capital International Airport. Days Inn Forbidden City Beijing is located in central Beijing, adjacent to the Forbidden City, which is close to the downtown area. To the east is Wanfujing Street, along West Chang An Avenue and with a 3 minute walk to Tiananmen Square., The hotel is surrounded by the Forbidden City and the People's Congress Hall, which create a superior cultural and artistic environment for the establishment. To airport: 30km To railway station: 8km To downtown: 5km, Home Inns-Beijing Dewai Inn is adjacent to Dinghu Park and the drum-tower. It abuts to Xizhimen Commercial Street, Fulite Business Street and the long-distance bus station. The hotel opened in 2006. Distance to the railway station: 2 km, 10 minutes driving Distance to the airport: 22 km, 30 minutes driving Distance to the exhibition center: 5 km, 15 minutes driving Distance to Jianguomen: 2 km, 10 minutes driving Surroundings: Tiantan Park, Beijing Amusement Park, National Sports Bureau, Longtan Lake Park., Beijing Sicily Hotel is located in the central city, adjacent to Beijing Amusement Park, National Sports Bureau, Longtan Lake Park and Tiantan Park. There are Hongqiao and Panjiayuan curio markets, where you may find treasure. Distance to Olympic Main Venue: 10 min; Distance to raiway station: 20 min Surrounding: The Temple of Earth, Imperial Academy., Xing Hua Yuan Hotel is on the new subway line 5, adjacent to Universal Trade Center and the National Exhibition Center. 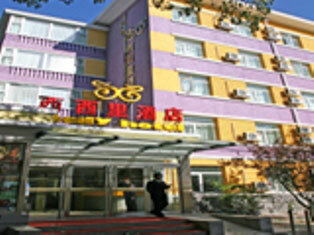 , The Ping'anfu Hotel (Ping'anfu Binguan) is a luxury hotel located in the hustle and bustle of the city center. It is only 4 kilometers from the railway station and 28 kilometers from the airport.